Daily small-group tours of Niagara Falls and the surrounding region. This is the only tour that departs early in the morning, so you can avoid sitting in traffic and will arrive in Niagara Falls before the huge crowds. Plus, you will return to Toronto early enough to have a full evening to enjoy the city! 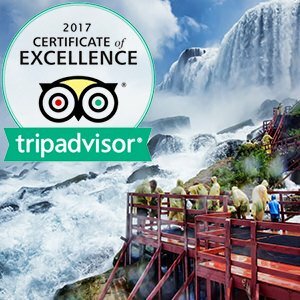 Our mission is to bring you the best one day Niagara Falls experience possible. 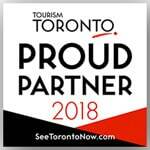 We are Toronto’s most reputable and highest rated Niagara Falls tour since 1991 and are a proud partner of Tourism Toronto, the Niagara Falls Tourism Association and Destination Ontario. Pick Up: Free pick up from most Downtown Toronto hotels and central locations. Select a location below or type your own hotel/address. You will receive a ticket with full pick up details to your email after booking. Payment: Pay with credit card when you book or pay with cash on the bus. Free cancelations with a full refund upon request. We use vans and minibuses for our tours. Tour group sizes range from 6-24 people. For private tours or other inquiries, email us at reservations@tourstoniagarafalls.com. Optional activities, prices extra. We will take you to the ticket box during the tour so you can decide on the day if you wish to join these activities. We arrive early, before other tour groups and people so you won’t have to wait in long lines to buy your tickets. We have been providing Niagara Falls bus tours from Toronto since 1991. Our tour guides have all been in the industry for over 25 years, so you’re in good hands! Tour groups are usually with 6-12 guests, sometimes up to 20. Our Niagara Falls day tour and Niagara Falls winter tour are with small groups and are fully narrated. The tour is approximately 8 to 9 hours long. We pick up from most Downtown Toronto locations. We depart from Toronto earlier than other tour groups in order to avoid traffic and large crowds in Niagara Falls. Why travel with us? You will save hours worth of driving time compared to other tour groups who leave later in the morning. When you arrive in Niagara Falls you won’t have to deal with huge crowds because we will be there early. This means you will have more time to explore and participate in activities like the Hornblower boat ride or Skylon Tower observation deck. Find out why hundreds of reviewers from Google, Yelp, TripAdvisor and Viator all give us top ratings. Book your tour now! Daily Niagara Falls tours from Toronto. Depart around 7:30am and return around 5pm. The tour includes free time in Niagara Falls, Niagara-on-the-Lake, Niagara Whirlpool Rapids, Wine Tasting and other seasonal stops. Queen Tour Niagara Falls Tours is a sightseeing tour agency and tour operator based in Toronto. Our service area is in Downtown Toronto. We pick up from most hotels and locations. Click here to view a list of our pick up locations and times, to find your closest location. You can also enter your own address and we will send you a pick up time. We do not pick up from Toronto Pearson Airport. Click here to find us on Google Maps and get directions to Downtown, Toronto if needed.